For three weeks in March 2019, artist Patrick Dougherty worked with Arboretum staff and volunteers to create a whimsical, site-specific sculpture in the Butcher Sculpture Garden. The piece, named Loop de Loop, is reminiscent of a roller coaster with its numerous spirals and switchbacks. The top of the sculpture is bound together with sticks wound like pieces of twine, connecting nearly a dozen rooms below. One gallery blends into the next through a maze of light-filled tunnels. 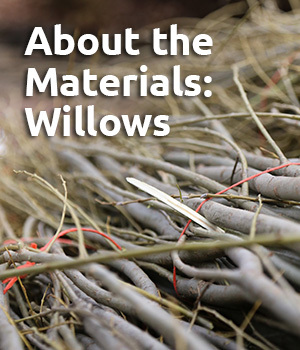 The sculpture was created using hundreds of willow sticks and saplings including purple willow (Salix purpurea) and Miyabe willow (Salix miyabeana) from upstate New York. The piece will remain in place for as long as it lasts in the natural environment, anticipated to be two years. Patrick Dougherty combines his love of nature with his skills as a carpenter. Utilizing primitive techniques of building, Patrick uses tree saplings as construction materials, recognizing them as a renewable resource to which everyone can relate. During his career, Patrick has created almost 300 large-scale, temporary sculptures at gardens, universities, and museums throughout the world. To learn more, visit stickwork.net. Exhibit Duration: Patrick Dougherty’s original sculptures are intended to be temporary. They typically last for one to two years depending on the severity of the weather. Located in the sculpture garden. Click here for a Visitor Map. Back by popular demand—renowned artist Patrick Dougherty returned to the Morris Arboretum for his third visit in March, to create one of his signature stickwork sculptures. Dougherty’s first exhibit for the Arboretum, Summer Palace, debuted in 2009, followed by Waltz in the Woods in 2015. Once his sculptures are erected, they remain in the garden for approximately one to two years, or as long as they last in the natural elements. Dougherty’s newest creation is named Loop de Loop and resides in the Madeleine K. Butcher Sculpture Garden, which has perfect site lines to be seen from many points of the garden. A Waltz in the Woods was created from willow saplings. Below are the specific types. Salix purpurea ‘Fish Creek’ – Fish creekpurple willow, used for the vast majority of the piece. Zelkova serrata – Japanese zelkova, used as structural pieces. Learn more about the work of Patrick Dougherty at www.stickwork.net. This exhibit is supported in part by the Madeline K. Butcher Fine Arts Endowment.